The final Xbox One design was originally one of thirty prototypes. The Xbox One's physical design could best be described as putting the box back in Xbox. Eschewing things like rounds and curves it's defined by the same ninety degree angles that the world's best engineers embraced at the dawn of the VCR era. 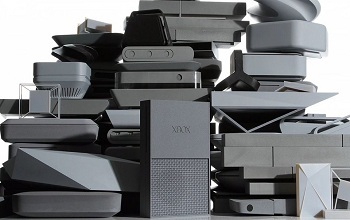 We're not saying it's a bad design, and we can certainly appreciate the potential for future console stacking. That said, how much effort could it have taken to turn the Xbox into a literal black box? Quite a bit it would seem. In fact, while the Xbox One design team would eventually settle for its ninety-degree angles approach, initial design efforts produced around thirty alternative design sketches. The sketches, in turn, were taken to an in-house model shop where they were transformed into 3D prototypes. "We wanted to make it simple and elegant, and we wanted it to be crafted and tailored, so it's all about quality," said Carl Ledbetter, creative director for Xbox, speaking at Microsoft's Worldwide Partner Conference. "Using those principles, we started to design." The models would be run through a ringer of real world environments, including tests to see how each design would look and fit in "people's living rooms." An engineering team would then look at each design and dermine the best way to fit all the console's internal doohickeys. The extensive testing wasn't limited to just the console itself however, the company would also produce more than two hundred different versions of the Xbox One controller. "We found that, when people put these in their hands, could tell the difference between a 10th of a millimeter in size," said Ledbetter. Whether or not the fruits of Microsoft's efforts wound up being the "understated" and "approachable" design the company was looking for is arguably debatable. That said, it would interesting to see more of the considered alternatives and the different routes Microsoft considered for the Xbox One.